As we flagged up in F&C 205, Jake Phipps recently became the proud recipient of the Claxton Stevens prize, which was awarded for his stunning 'STELLAR Console' table. 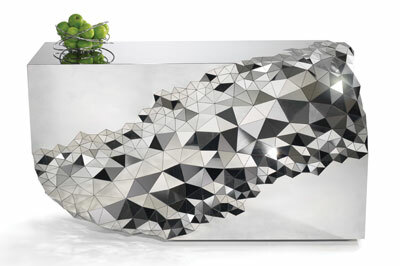 Made from polished stainless steel, this piece could be described as being almost futuristic in its appearance. 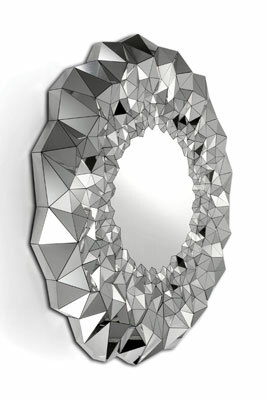 This piece and the matching mirror are both made in super mirror-polished steel, each piece cut and placed to refract the light. 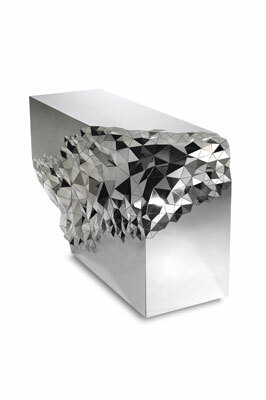 The 'STELLAR Console' is a polished, structured, utilitarian mimesis of an opened amethyst geode. 900 individually sized and angled mirror pieces are placed across the table diagonally, and each segment is meant to capture a different shade of light and colour. Jake contrasts the crystalline mirrors with expansive, smooth surfaces. According to Jake, the non-uniform terrain of the table creates "an optical dispersion that breaks down the light and surrounding environment, delivering it to the eye as one sparkling identity." As documented on the Design42Day website "his commitment to this aesthetic is evident in the table's oblique shape, in which the top-right and bottom-left corners are curved. However, he subverts his imitation of a gemstone by making the other two corners perfectly convex. Overall, the table retains a degree of symmetry that one would not find in a natural stone." Here is a designer who does not compromise sleek, balanced design and the result is a spectacular table with a conceptual edge. Now this piece won't appeal to all, but you can't deny this man's obvious talent and the fact he has done incredibly well for himself. 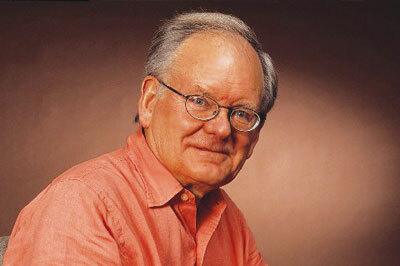 His list of contacts and clients would make any furniture maker or designer green with envy, so where did it all begin? 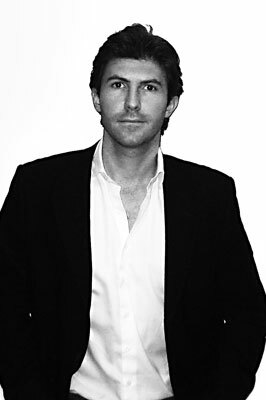 Jake graduated from John Makepeace's furniture design school, Parnham College, back in 1999. Towards the end of the '90s Parnham was gaining a reputation for creating designers with an eye for the contemporary process of CAD-led design, and we make no apology for taking the time to celebrate the work of a craftsman whose most recent work consists entirely of metal. Jake was one such designer who has embraced the notion of contemporary and has gone on to push and challenge the design process further. As Jake reiterates, Parnham was pioneering the trend for incorporating computer software as a tool for both designing and manufacturing, and the Internet was just starting to become far more accessible. "I seem to remember ours being the first year that didn't use drawing boards," he explains. "Whilst cabinetmaking was at the core of Parnham's teachings, we were also being introduced to a whole range of industrial production processes that were becoming more available for designer-makers." Jake started his career as a cabinetmaker, designing and making one-off pieces to commission. He describes these first few years after leaving Parnham as being "hard work and a bit haphazard." Jake explains that at this time, he wasn't entirely certain of what he wanted to be - designer or maker - and whether he wanted to deal with commissioned work or production pieces. "I found my strengths and weaknesses quite quickly, though - mostly through trial and error and always knowing that the rent needed to be paid at the end of the month." It was in 2005 that he decided to set up his own design studio in London. He now deals with projects varying from one-off commissions, to limited editions and production pieces and has also added a number of items to the retail market. Jake tells us that, on occasion, he does make speculative pieces, although the majority are commissions. For example, the 'STELLAR' range was speculative: "I chose to make it a limited edition range in order to still retain a high value to the pieces but recoup some of the initial tooling costs," he explains. As we guessed, Jake doesn't make everything himself, so we asked him to explain the setup he uses. In order to keep costs low and due to the fact that time is a major factor, Jake tends to subcontract out work to those who are far quicker and cheaper than his workshop can be. Although as Jake tells us: "We still make prototypes and the limited edition pieces where we can have 100% control on quality." Jake recently launched two new products at MOST, the design destination instigated by British designer Tom Dixon at Milan's Museum of Science and Technology. It provides Milan Design Week with a curated creative hub, promoting forward-thinking culture, commerce and creativity against the extraordinary backdrop of historic exhibits based on technological innovation. The first new product he introduced was 'SHELL' - from his 'Furniture with Firepower' range - a range of stools in a replication of an empty shell casing. This is essentially a stool inspired by discarded empty ammunition cases. It is made from vacuum metalised polycarbonate and is available in a bronze or silver finish. The second is 'APOLLO', a pendant light with impeccable environmental credentials which is made from brass and coconut fibre, the manufacturing of which supports cottage industries in Sri Lanka from initial harvesting to final construction. Also on display for the first time were a new line of coconut fibre tables. When we asked Jake to describe the whole experience, he comments that the exhibition was "frantic, if not a little subdued, as it has been for the last few years." The two new pieces received a huge response from both press and retailers alike, and as such Heal's will soon be stocking the 'SHELL' stool. Just as exciting is the news that the 'APOLLO' light received over 30 press enquiries. As well as larger pieces, there is also a bespoke lighting range which Jake offers, which is available at Heal's. 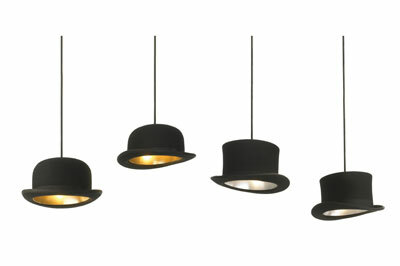 The 'Jeeves and Wooster pendant' lights were designed as a playful take on lighting with a real sense of cultural identity: "The hat is an object that often associates its wearer with a particular society, heritage or race," he says, "whereas the 'Top Hat' and 'Bowler' hats are classic British cultural icons reflecting a bygone era of imperialism, class divide and eccentricity." These lights were launched in 2008 in Milan, followed by an installation in Harvey Nicols. They were also featured in a Ford Ka TV advertisement. Other clients have included Tommy Hilfiger, Philippe Starck, Google, Selfridges, Links of London, Riva, Innermost, Intercontinental Hotels, Novartis, Diageo, and The Victoria and Albert Museum. As you can see, this list of clients is incredibly impressive, not to mention diverse, including hugely influential, powerful and established brands. "I now specialise in creating a wide range of objects designed specifically to produce an affecting response with effortless functionality, playful aesthetics, and a natural elegance," he says. The Jake Phipps studio caters for a wide range and scale of projects both commercial and domestic. Jake's work is characterised by a narrative yet functional aesthetic that aims to strike a strong emotional chord with the people that will use them. His first commercial product, the 'ISIS' folding chair, was launched by the highly respected Gebruder Thonet, Vienna and is the world's thinnest folding chair in production. So was this chair a commission or a speculative piece? According to Jake, it actually came from a project brief given at Parnham to design a folding chair: "My solution was very nice but not that commercial and a few years later I decided to revisit the chair, making it thinner and easier to manufacture. It was picked up by Thonet Vienna, part of the Poltrona Frau group, and was the first folding chair they had produced since 1930. The 'ISIS' folds flat to a slim-line 30mm and combines inventive design with superb function. However, this is no museum piece; it's definitely a chair made for sitting in. It is made from a series of flat geometric panels that are linked together and contained within its own frame. Each panel is constructed from several high strength laminations which are designed to ensure that the chair flexes and supports the user, providing an unexpected level of comfort. 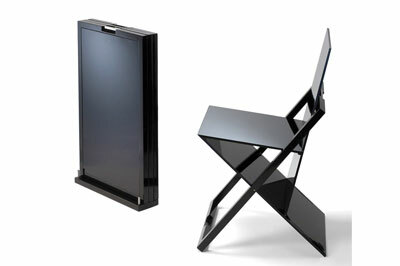 Dutch architect Gerrit Rietveld would have loved this chair. Since his own 'ZigZag' chair is flat-seated but comfortable, there's a good chance this chair is as well. It's obvious from some of Jake's work that material choice is crucial to the outcome, but at what point does it come into the design process? According to Jake, concept always comes first: "Sometimes material choice is part of that concept but more often than not it comes later down the line. By getting an understanding of how to fulfil the initial concept, I tend to be led to several or maybe just the one viable production process. I will then look at what materials best suit this process, factor in cost and perceived value, and only then decide on the material choice." So, with this in mind, are there any materials that he tries to avoid? "Obviously the more environmentally sustainable the better," says Jake. "I avoid anything that I don't have a full understanding of where it originates from. I also need an understanding of the social implications of using that material and its subsequent use in manufacture." In terms of any materials that he has not yet mastered, Jake comments that he would be a fool to say he has fully mastered any yet. "Each material has its own distinct advantages and disadvantages. There is an almost impossible task of designing a piece that has the perfect material balance of aesthetics, durability, cost, sustainability, and so on." It has to be said that Jake's work is also incredibly clever; tables stretch or adapt to grow, all the while maintaining the integrity of the design and the material, as seen in the 'SENTOSA' table in rippled sycamore. This is a piece that particularly caught our eye, and we wondered if this was purely a one-off or is Jake planning on making any others? He explains that the basic shape has been repeated in different size configurations and different materials for different clients - but in essence they are all one-offs. Responses such as these just go to highlight the immense skill which Jake possesses: being able to take one design concept and modify it in terms of size, but still produce a piece that echoes the original design brief and ethos. With this in mind, it comes as no surprise that he has been described as one of the new generation of makers using digital processes to produce startlingly beautiful and meticulously hand-crafted furniture, an exciting development which has occurred over the past few years as the technology has become more widely accepted by people in the craft. One such piece which has received criticism over its green credentials is the 'Love Seat'. This sculptural piece, made in solid cedar, is described by Rob Cassy of The Times as being "massive, enduring and solid as a rock, and there is a tenderness and grace of line that fills it with life. The fantastic rotational symmetry makes it a vibrant abstract sculpture; careful consideration of the human form makes it a comfortable, functional seat." Despite contrasting views, we were intrigued to find out how much goes into the concept and design of a piece, and does Jake find it irritating when folk don't get it? "Some people do jump to conclusions very quickly but I don't find it irritating," he says. "The cedar trees that the loveseats are made from are FSC certified, with the manufacturer planting seven new trees for every one they use." It cannot be denied that environmental concerns and implications of the pieces he creates are at the forefront of this designer's mind. Here we have a designer-maker whose pieces are not only sustainable, but, as with the 'APOLLO' light, such pieces are also supporting those in developing countries. Jake is undeniably a designer-maker with a conscience. So what does the future hold for someone who has already achieved so much success and is continuing to push the envelope as far as design, sustainability and embracing ever new and exciting materials is concerned? Well, according to Jake, he is currently developing a range of lighting and furniture that will be made entirely from coconut fibre, a further extension of his very successful 'APOLLO' range that was mentioned earlier. The coconut is an incredibly sustainable material, taking just 45 days to grow, and has great social implications as well, as we detailed above. So, it seems that the future is incredibly bright for Jake Phipps; we wait with bated breath to see just what comes next, but if his future designs and commissions are anything as cutting-edge as pieces such as 'STELLAR Console', then we are surely all in for a treat. The Claxton Stevens Prize was set up by liveryman, and later Master of the Furniture Makers Company, Christopher Claxton Stevens to mark the re-launch of the Furniture Makers Guild Mark Scheme in 1989.It is awarded, by a vote of the Guild Mark Committee to the maker of the most outstanding Bespoke Guild Mark that the Committee has awarded during the previous year. There are normally between six and 12 pieces to choose from. The winner is invited to the Installation Dinner, usually held at the Mansion House in May each year, where the winning piece, or a display about it, is put on show and a £1,000 cheque is presented by the Lord Mayor during the evening. A complete cross-section of furniture, from boardroom tables to display cabinets and lecterns to humidors, have won the prestigious award and winners have included Broadway Malyan, Martin Grierson, Marc Fish and Silverlining Workshops. Only on three occasions has the same firm won twice: John Makepeace, Andrew Varah, and Alan Tilbury with Ian Heseltine. Usually the winning piece has been made primarily of wood, but the current winning piece for 2012/13 by Jake Phipps contains no wood at all. The School for Craftsmanship in Wood later known as Parnham College â€“ or just as Parnham â€“ created generations of makers who helped stimulate the current renaissance in cabinetmaking. Long after its closure in 2000, it remains the blueprint for many privately owned teaching facilities although its reputation is yet to be surpassed. Running alongside the College and finding worldwide acclaim founder and mentor, John Makepeace, supported by his workshop team, designed some of the most iconic pieces of furniture of the last century. While its roots were anchored in traditional craft values, Parnham embraced a modern approach to tackling issues that have only become accepted as the norm in more recent years. The course also encouraged the broadening of ideas and influence in designs, as well as looking at art sculpture and architecture, rather than other furniture makers. Closure of the college could in part be attributed to a lack of sponsorship for which there would likely be little resistance to nowadays. Sustainability and integration of ethical manufacturing processes are hot topics now but were once considered low priority values. Parnham was an institution very much ahead of its time with the likes of Jake Phipps being among the first to incorporate 3D modelling software like Form Z into his design process. The full extent of the Parnham legacy lies not with the Makepeace years but with the students he influenced.